HousingWorks Austin is a nonprofit organization that aims to increase the supply of affordable housing in Austin by providing research, education, advocacy and thoughtful, workable affordable housing policy recommendations. 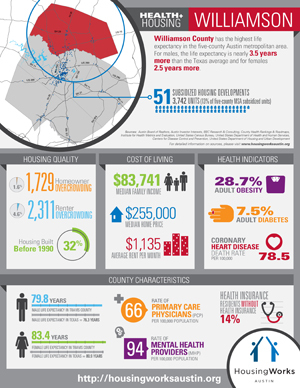 Williamson County has the highest life expectancy in the five-county region. Compared to the average for the State of Texas, the life expectancy for males in Williamson County is nearly 3.5 years greater and for females 2.5 years greater than the average. The county also has the highest median income in the five-county region at $83,741. The life expectancy for Bastrop County and Caldwell County is either below or barely equal to the state average. More than half the adults over twenty in Caldwell County live with obesity. 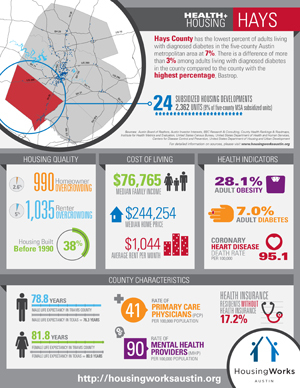 The county also has the highest rate of deaths due to coronary heart disease at 134 cases per 100,000 residents. The county has the lowest average rent per month among the five counties but it also has a high percentage of overcrowding and older housing. Nearly 60 percent of the housing in Caldwell County is more than 25 years old. 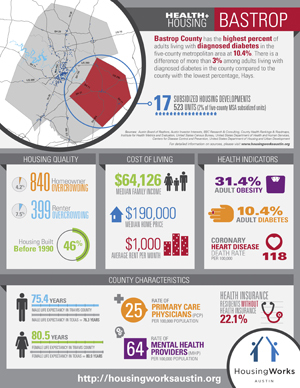 More than one-tenth of adults living in Bastrop County have been diagnosed with diabetes. Three percent more adults have been diagnosed with diabetes in Bastrop County as compared to Hays County, which has the lowest percentage of adult diabetes. The county also has the highest percentage of residents that live in overcrowded housing with more than one person living per room. 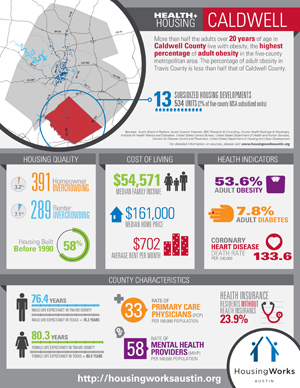 Travis County has the highest rate of primary care physicians and mental health providers among the five-county region. 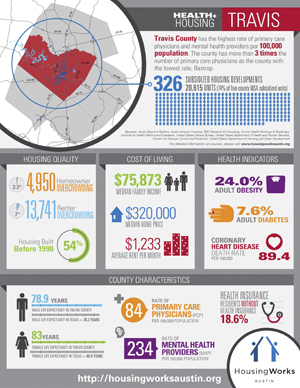 The county has three times more primary care physicians as compared to Bastrop County, which has the lowest rate. Travis County also has the highest share of subsidized housing developments among the five-county region. Nearly three quarters of the region’s subsidized housing units are located in the county. Click here to view our research SOURCES AND METHODOLOGY.